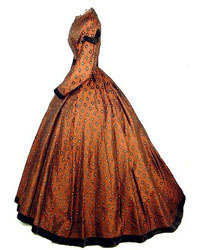 I like to have pictures of dresses from the 1860s to make sure my dress, accessories, and hairstyles are period correct. I will file these away in the correct time period in the categories list for you to reference later. If you happen to have the link to this particular image, please share it in the comments so it is linked correctly!